Dish - Gold Majestic Tea Cup (20/rack) Tea Cup (20/Rack) B&B/Sa.. Dish - Gold Majestic B&B Plate (20/rack) Tea Cup (20/Rack) B&B/Saucer (20/Rack) .. Dish - Gold Majestic Salad Plate (20/rack) Tea Cup (20/Rack) B&B/Sau.. 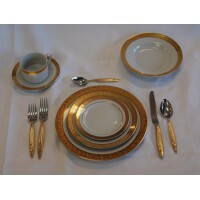 Dish - Gold Majestic Soup Bowl (20/rack) Tea Cup (20/Rack) B&B/..